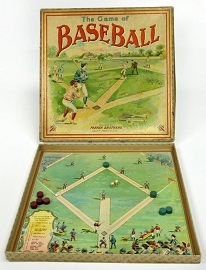 "Dice Baseball: a tradition -- history and homebrew versions"
"Dice baseball" -- now there's a great American tradition. Yeah, what ever happened to that? 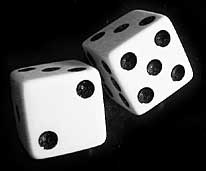 A pair of standard dice. A scoresheet and a pencil. A little imagination (the more the better). to show you how to play it. 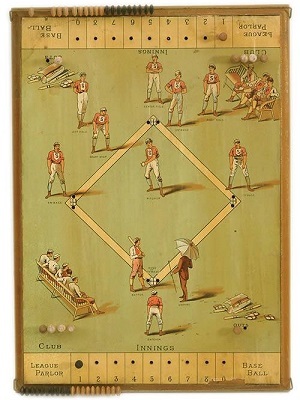 titled something like "Question about ancient baseball game" or "Help me identify antique card,"
else will have an answer we don't and that we ourselves will thereby actually learn something. the 1980s or '90s, which makes the cranky old buzzards here feel just a little older and crankier. on computers, babysat by video-game consoles, and miserably addicted to texting and twittering. 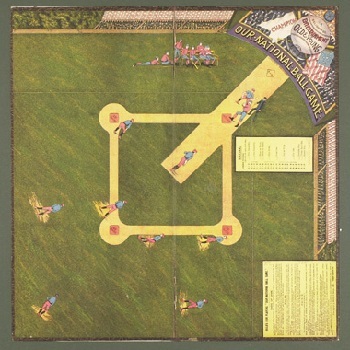 pastimes, and in particular traditional games. entertainment -- is something they find literally difficult to picture, indeed difficult even to believe. providing some pleasurable exercise for those woefully atrophied muscles of imagination. table of results, scoresheets, and a pencil. tack, he had no memory of how or where he'd learned the game. 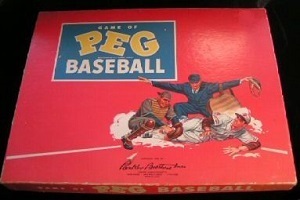 of Game of Peg Baseball. possible with the dice. 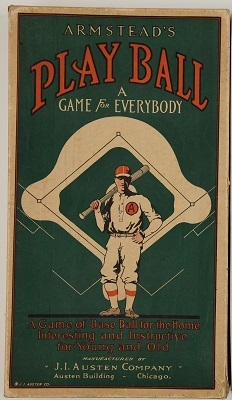 This made for a larger variety of play results -- including "strike,"
survives more than a century and a quarter down the road. found on the internet, and in any number of books titled something like "Games for Kids"
game taught to them by a family elder, and we'll include several such inventions below. the stories they hold, that most intrigue us. realm of simulation games with results individualized for each player in the line-up. 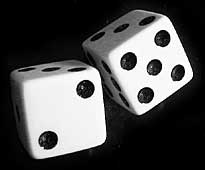 than three dice, and uniform, generic odds for all players. A "starter" game, if you will. 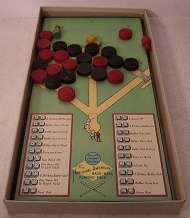 with coins or buttons to indicate baserunners helps them visualize the play as well. out of whole cloth (still more imagination required there, and we think more fun). different templates you can print out. Seriously, how else can you know who's up next? a selection of the most popular and most noteworthy -- and show you how they worked. 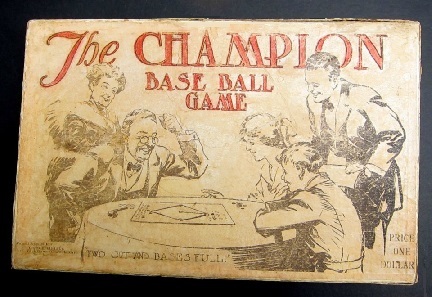 with a sampling of dice baseball games we've seen on the internet. keep that in mind when choosing a game to try. and on the two other sides "O." Rolling an O ends the half-inning. of 5 or 6 the same as O.
providing us the rules sheet. and homemade dice baseball games that followed. strikes will add a few more outs in gameplay. gaming, they belong in the Hall of Fame. 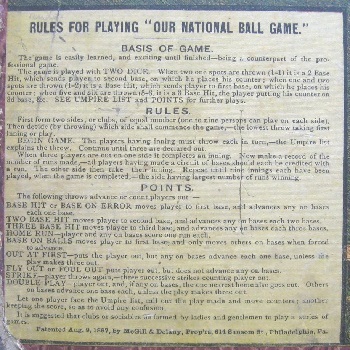 amateur cachet in 1906 as The College Base Ball Game. -- as a frequent occurrence among the play results. H (home run), and on two faces O (out). inexplicably popular for over a decade. a successful throw by the team at bat. A popular item into the late 1920s, this. to allow or negate roll by offense. did not get them any closer. few examples of it survive. And there we're going to cut short the parade of early commercial dice games. as .211 (4 H, 15 O). Two variations that did work are at far right. our grandkids. See if yours like it. it should provide a remarkably good game. 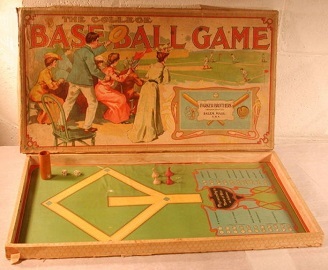 Mississippi) about to enter the 4th grade... 1944.
me [this] dice baseball game." 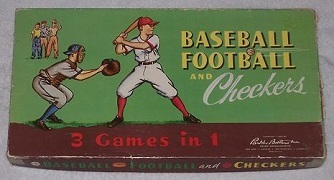 and what versions of the game they played. card was in my 'league.'" weekends in the 1983-1985 timeframe. Six-inning games. One die. If a hit, one more roll of the die. perfect game by Matt Young. We had some great times. "We used to argue about the legality of dice rolls. a 2 (i.e., a hit). He would do it over and over again. when he was nine or ten. and he spent hours with me playing this game. around 1958 or '59 -- I was nine or ten. there were a few games in college also. region. Eh, maybe just coincidence. sometimes individually. We used three dice. The game was simple, and lots of fun. during the week to be creative with the love of baseball. 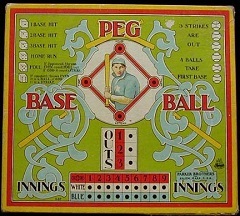 a single;  base on balls and K's -- can't remember those;  all other numbers were outs. and recorded the 'game' on a portable tape recorder." meaning the same result for everyone (e.g., double 4's = HR). 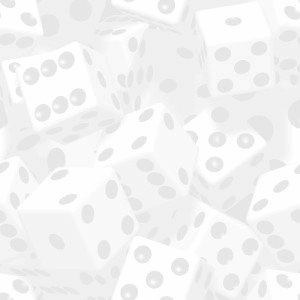 each player having their own results for each possible roll of the dice. 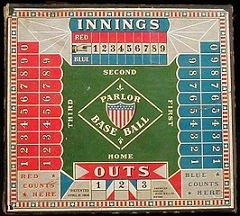 1/1, 1/2, 1/3, 1/4, etc, thru 5/6 (double 6's was reserved for 'miscellaneous'). a triple and 1 or 2 reached on error ... whatever you wanted to make it). K in there for those who fan a bit more than average, etc, etc. the other pair if applicable. This helped separate the better pitchers from the others. were simply listed as groundout, fly or foul out, and line out. no weight for greatness. Mays could bat .125 and Gus Gil .300.
through trades that we would have the same guy playing for each side. beginning and Davis just kept hitting all season). turn a double into a homer, or an out into a walk. "For stealing bases, another chart was simple, with outcomes based on a player's SB total, like 0-5, 6-10, etc. If a player had more than 50 SB, die rolls 2-6 were safe, only one was out. 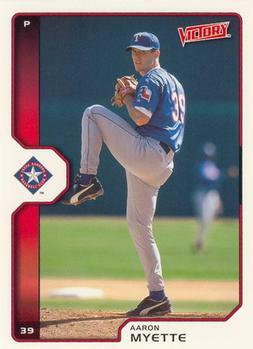 if it meant stealing Harmon Killebrew into a certain out) and then stealing Brock all the way around. if a kid had 4 singles, a double, and 6 strikeouts in 25 plate appearances, I could replicate those odds exactly. pitcher strength wasn't factored in, or defense, and I don't think stolen bases had a very sophisticated mechanism. "I contacted a couple of coaches of other teams to see if they had well-maintained scorebooks, but none did. That would've been cool, to have cards of all the kids in the whole league. when guys get 500 at bats, it's a different story. 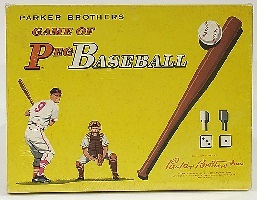 can take some cuts against Grover Alexander... "
these other internet versions are presented as lessons or "fun exercises"
"What is it:  A long-played math baseball game using dice. "It's a fun at-the-end-of-class or at-home game. 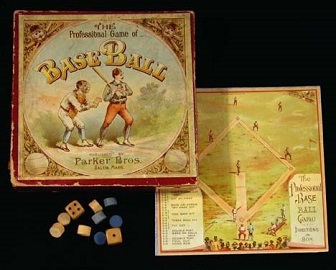 markers, a sheet of paper with a baseball diamond drawn on it. students a possible math game for the summer. and fractions, and baseball rules. 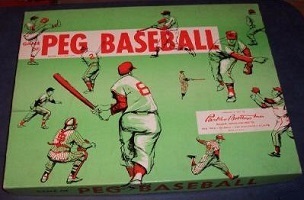 forms, we drew a lot from Bob's version of Dice Baseball." Each player rolls one die. two dice gives the result. e) if he has men on bases 2 and 3, both are safe. 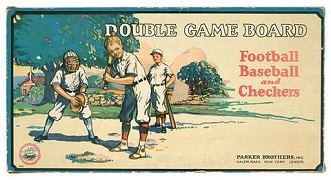 a player's half-inning is ended, and his opponent takes over. the dice means. Make it your own! Make it a tradition.